Thanks to Bruce I enjoyed the Max Fleischer cartoon I Ain't Got Nobody . This Max Fleischer cartoon was released as a Follow The Bouncing Ball cartoon on 17 June 1932 . The concept was popularized in movie theaters of song slides showing lyrics of well-known tunes to invite audiences to sing along with live singers or musicians. The Fleischer Brothers adapted the idea, committing it to animated drawings with live-action footage featuring the talents of famous musical personalities within the context of the films. ( source: The Encyclopedia of Animated Cartoons by Jeff Lenburg ). In fact these Follow The Bouncing Balls cartoons were the karaoke of the 1930s and nowadays these films might have been played on TV-stations like MTV or The Box to promote the Hits of the moment. That brings me to the next. While enjoying the cartoon/film I learned that the young Mills Brothers sing several songs. Not only I Ain't Got Nobody, but also the Tiger Rag and Goodbye Blues. This Goodbye Blues is the opening scene of the film. Isn't it cute that, thanks to this film, we can see these youngsters ( the brothers were between 17 and 22 years old here) singing as they performed for the Durium Crisco commercial? And it even seems to be the same recorded version !! Enjoy the Follow The Bouncing Ball cartoon I Ain't Got Nobody ( introducing Goodbye Blues and Tiger Rag) released 17 June 1932. Did anyone ever see this card board record? I never did and i love to have a scan of it. 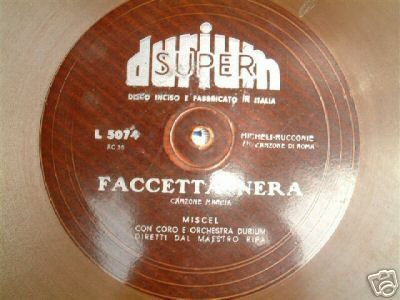 Rainer L. sent me an image of an Italian durium record, that was slightly different from the label I had already in my discography. Cover: disco del successo durium cinque lire. 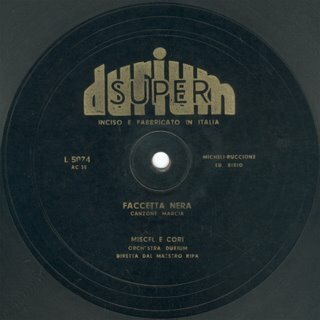 On the reverse of the cover a picture of a DURIUM REAL gramophone Fonovaligia DURIUM REAL - Con questa nuovissima fonovaligia, che possiede tutti i requisiti di una macchina di alta classe, si è risolto il problema di conciliare due fattori apparentemente inconciliabili: prezzo e qualita. L’ULTIMA PAROLA NEL CAMPO DEI FONOGRAFI Prezzo Lire 200, - USARE PUNTE NUOVE PER OGNI AUDIZIONE - FISSATE IL DISCO ALL’ASSE DEL PLATTO MEDIANTE IL FERMADISCO CONTENUTO IN QUESTA BUSTA . Thanks Rainer for your additions. The online Durium (GB) Discography, with all information about the European 1930s card board records has been enlarged with a new page. This page contains the matrices E-1101 up to E-1114 with Carson Robison, Sam Browne and Elsie Carlisle in the EN-series and some early Swedish records in the SC-series. Did you ever visit our other project blogs? Being a Hit of the week collector I am fascinated by the kind of music that's on the records. Critics say, it's no jazz ! They're complete right; it is straight jazzy dance music, played from a stock arrangement and it has a steady swing. What more would you expect? While listening to the records you try to imagine how the bands looked like and how it was played. No films with Hit of the week orchestras exist, nor images. We only have a 1930 drawing of a Durium band by Russell Patterson. A few days ago Bruce ( member of 78-List) forwarded a link of an early sound film by the Ben Bernie Orchestra. It was made in 1925 and when I saw the film and heard the music I was fascinated by the similarity between this film and the drawing made by Russell Patterson, the artist that made the Durium orchestra used for several Durium covers or Hit of the week needle sacks. Did you found the director? He plays the violin like Bert Hirsch did lead the Hit of the week Orchestra. Did you find the piano? It's on the same place as in the cartoon. The tuba, banjo player and the drums moved over a bit, but the trumpet player and trombonists are present using hats to muffle the sound. There is a bass player on the film, ok - mind that it was impossible to record this instrument in those days. Did you notice the slightly tapping feet of the musicians and the relaxed way they perform? And mind the playing time of the medley ( more then 4-minutes) - longer then the average record plays.... Where did I heared this before? When you feel to reach the 3-minute border, a new extra chorus is started.as if it was a so-called 5-minutes Hit of the wek record. When I compare the personel of the Ben Bernie band in the mid-1920s only Bill Moore, trumpet player, has recorded for Durium in 1932. Did you count the members of the band. Isn't that cute? Thanks Bruce for posting the link at the 78-L news list.